One of at least 14 illegal immigrants trying to flee law enforcement near a Texas beach is believed to have killed two tracking dogs. One suspect may have ties to a Mexican drug cartel, say authorities. The case took place north of Holiday Beach, more than 150 miles north of the Texas border, when state and local police were trying to stop a human smuggling attempt, the Aransas County Sheriff’s Office revealed in a prepared statement. A black Ford truck was headed north on Highway 35 as it was trying to flee law enforcement when it crashed through some fencing and stopped near a brushy area. Between 14 and 16 individuals reportedly ran from the vehicle. Authorities responded to the scene with a group of tracking dogs from a private kennel. 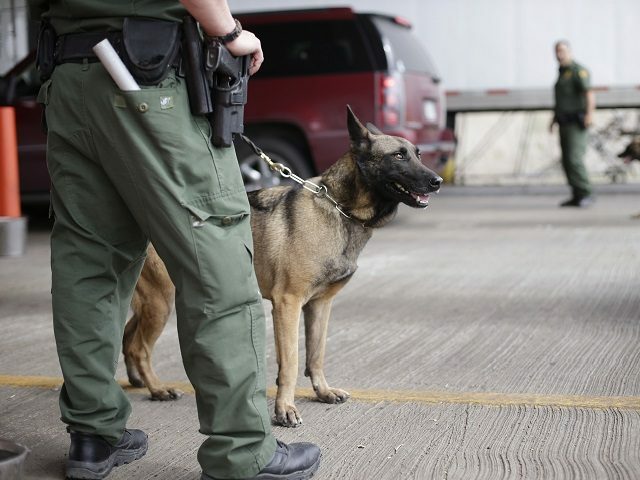 According to police, the dogs are not trained to bite like K-9 officers–but are used for search and rescue operations. Authorities were able to find five of the individuals in the brush. A sixth man turned violent, telling law enforcement “if you want me, come and get me,” police said. Authorities arrested the 6th man who was described as having a cartel tattoo. Police found the bodies of two of the tracking dogs who had been strangled with their collar. [W]e are still dealing with individuals who may have questionable immigration status these encounters can turn just as violent as any domestic dispute we respond to. And while every effort is being taken to ensure everyone’s safety, we are reminded that not everyone we encounter shows the same level of respect for the rule of law and or life even for highly trained animals. Editor’s Note: This article has been updated to include additional information about the arrest of the sixth man.